The European Commission is putting pressure on the English Premier League to change the way it sells televised football rights, or face possible antitrust action for breaking EU competition law. The Commission, the civil service arm of the European Union, has been unhappy with the way Premier League football matches in the UK have been sold. At the moment satellite broadcaster Sky has what is in effect an exclusive deal with the Premier League to show live matches. Sky will show 138 live televised matches from the Premier League this season, via Sky Sports and Sky PremPlus, but the commission wants the market opened to competitors when current deals expire in 2007. "We have been in touch with the Premier League over the arrangements for media rights from the 2007 season onwards," EC competition spokesman Luc de Hert told the BBC. "The league has made some proposals, but they have not been seen as satisfactory. "We are waiting for new proposals from them, and expect them to send us something soon." 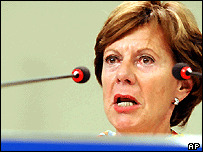 Competition commissioner Neelie Kroes has written to the Premier League, rejecting its latest offers. The commission has not yet taken formal action over any possible breaking of competition law. However, it could set out a formal "statement of objections" pointing out how it feels the current proposals breach competition law. A statement of objections can lead to financial penalties of up to one-tenth of a company's annual turnover worldwide. "They have the power to do that - but we have not had any indication they are preparing such a move," a Premier League spokesman told the BBC. "We are still two years from the next deal, and the structure of the packages is still being discussed. "As we have previously said; in future no one broadcaster will be able to hold the rights exclusively. "How we achieve that is what we are discussing with Brussels just now." However the commission is looking for more concessions, with some reports claiming it wants to limit any company's ownership to 50% of live games in future. That, however, may dilute the potential top price a TV company would be prepared to pay, if they are unable to win exclusivity. Harry Philp, analyst at Hermes Sports Partners said: "The European Commission want to see changes in 2007. "It remains to be seen how the league will package the games. We may well get a number of parties expressing a strong interest in 2007, or coming together in partnerships." He said companies, as well as Sky, that may be looking for a televised package - be they live games, delayed-broadcast matches or match highlights - could include Setanta, NTL, Telewest, the BBC and ITV. "Private equity companies are also looking closely at the situation and may compete," says Mr Philp. "However, even if you split the games up into separate packages, and you attract lots of bidders, you can't stop one party winning all the packages." 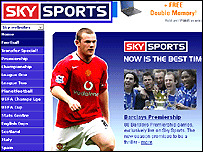 This happened in August 2003, when the Premier League awarded all four of its rights packages to Sky in a deal worth £1.024bn. The Commission claimed the deal was anti-competitive; but the league argued Sky had won all the packages on an individual basis. "We actually structured those packages at the EU's behest and it was only afterwards they were unhappy with the outcome," says the Premier League spokesman. The Commission is thought to be unhappy that a compromise to sub-license six to eight live games a season from Sky to other broadcasters fell through. The prices offered fell short of the reserve price agreed with the Commission, Sky said in April 2004. Yet, one factor which may help the Premier League is the fact that in France last December broadcaster Canal+ was successful in winning all the packages on offer to show live games, thus giving it 'exclusivity' too. It paid 1.8bn euros to buy the exclusive rights to broadcast French league matches for the next three years. "What happened in France is a good thing from the Premier League and Sky's perspective, as it went through on the same basis as the current English deal," says Mr Philp. However, it appears that after years of skirmishing the Commission is determined to force a rethink to the way Premier League TV deals are drawn up. "We can't go into the details of what changes we want to see come about, but there have to be changes," insists Mr de Hert.